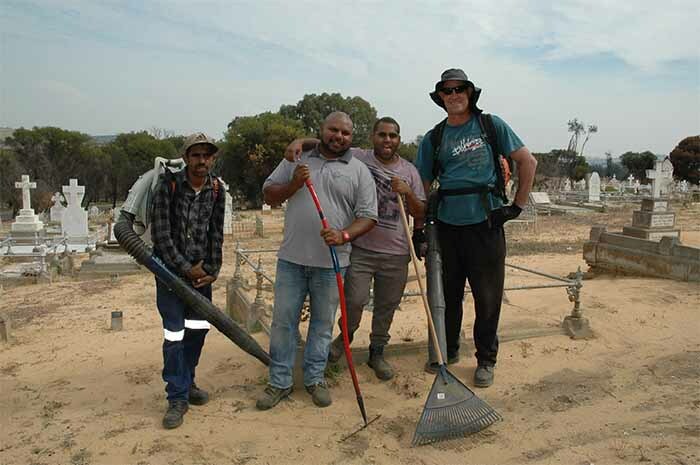 The Northam Cemetery has been given a facelift, with help from the region’s Noongar Boodja rangers. The cleanup was in response to concern from residents that the heritage listed cemetery was in desperate need of a cleanup. The Shire of Northam contracted a group of six Aboriginal rangers, managed by natural resource management group Wheatbelt NRM, to complete the job. They spent the week removing rubbish, cleaning up weeds and raking and tidying the grounds. Wheatbelt NRM’s Aboriginal NRM officer Jermaine Davis said it was one of a number of projects the Noongar Boodja rangers had been busy with. The Noongar Boodja Rangers are continuing to flourish with 50 community members actively participating in the program from across the Wheatbelt region. The Ranger program aims to give unemployed members of the Aboriginal community the opportunity to get back ‘on country’ doing natural resource management work. In 2016, 20 full days of work were undertaken including assisting Aboriginal land managers with planting bush tucker trials and establishing a ‘six seasons’ bush tucker garden at Northam Senior High School. The Rangers helped the Department of Parks and Wildlife with surveying threatened Black-flanked Rock-wallabies at Nangeen Hill Nature Reserve. They also undertook training with the Department of Aboriginal Affairs and carried out a site assessment for a gnamma hole in consideration as an Aboriginal heritage site. Jermaine said the group plays an important role in the community. “It gives the rangers a greater opportunity and respect from working on their country and they get a sense of ownership from the work they have undertaken,” he said. For more information visit Wheatbelt NRM's Aboriginal NRM Employment Opportunities page.